The new program ?Book with Points,? will allow loyalty program members access to Travelocity?s online booking engine. They will use points or miles to book and purchase the travel reward, exactly as if they were purchasing their travel with cash, rather than loyalty points and miles. Book with Points will be available both on the Points.com consumer portal and as a stand-alone, branded product for individual loyalty program operators. It?s expected to be operational in the fourth quarter of 2006. Rob MacLean, Points International?s CEO, summed it up nicely: ?While millions of flights, hotel nights and other rewards are provided every year, there continues to be demand for even more access and availability. Our agreement with Travelocity is uniquely positioned to help loyalty programs finally follow through on the ?any award, any time? travel promise, and to do so using our two companies? world-leading technologies.? Infosys? biggest challenge came in 1995 when Murthy and his team decided they couldn?t accept the tough conditions demanded by General Electric. They walked away from the U.S. firm?s business at a time when it made up 25% of Infosys?s revenue and 8% of its profit. BBX Reports Barter Company ?First? In our August 1 issue we reported on Lars Kraemmer, CEO of Bank of International Art Money (BIAM), and his ingenious trading format using Art Money. Below is a copy of a piece of Art Money, which one can consider as art or as money. You can frame the 12-cm x 18-cm (4.5? x 7?) work on the wall, or spend it when shopping in registered BIAM shops, when booking overnight stays at a BIAM host, and when purchasing art from the many registered BIAM artists. You will find all of these functions on the web site: http://www.art-money.org. Real Estate Economist Anticipates Hard Landing, Saying, ?It?s Ugly Out There? A bearish real estate economist, Christopher Thornberg, says the Southern California housing market is a bubble and beginning to pop. Thornberg was one of the first economists to declare that the housing market was peaking in September 2005. He says there has been large-scale overbuilding of homes and condominiums nationwide, and in So. California massive price appreciation has taken place that is just not justifiable by any kind of standards of reasonable economics. ?With interest rates rising in recent months and sales declining, the bubble is popping,? Thornberg concluded, ?just like a bubble is supposed to.? If you look at what your house was valued at three years ago and what it is now, he queried, is it really worth 70% more? His answer, ?There is no way you can justify the math.? Angelo R. Mozilo, 67-year-old chief executive of Countrywide Financial (the nation?s biggest home-mortgage lender), who has personally been in business for more than five decades, also had a sobering message for investors: ?Buckle your seat belts, I?ve never seen a soft landing in 53 years.? And the CEO of the country?s biggest auto retailer, Mike Jackson of AutoNation, delivered a stern message to his troops last week, ?Rising interest rates are going to pop the bubble in real estate, and that, combined with rising gas prices, is toxic to the consumer.? 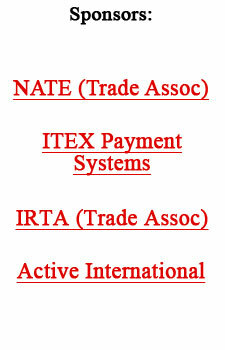 The following information was provided to us by the National Association of Trade Exchanges. The National Association of Trade Exchanges (NATE) held its 22nd Annual Convention August 10-12 at the Delta Chelsea Hotel in Toronto. Although the convention was not as well attended as previous events, NATE attendees enjoyed an extremely positive and productive three days of seminars, and sales and broker training. All attendees said they came away with a great deal of useful information that they plan to implement within their own trade exchanges. NATE continues to keep pace with the latest innovations in technology, and many of its convention sessions covered such topics as search engine optimization, and how to use technology to improve the visibility and efficiency of their trade exchange. Two viable ways that NATE is leading the pack, regarding technological advances in the barter industry, are through its newly redesigned NATE and Banc Web sites. Tom McDowell, Executive Director of NATE, said the association has received tremendous feedback from its members as to the ease of navigation and usefulness of these two sites. NATE continues to stand at the forefront of the barter industry as the premier association for independent trade exchanges worldwide. But, like any industry, the world of barter is facing many significant challenges that impact the bottom line of each trade exchange owner. NATE addressed several of these challenges with such discussions as ?Our New Competition and How to Combat It.? This session helped to identify and deal with the effects of the Internet, superstores, and other factors that are infiltrating the barter industry and affecting the way trade exchanges do business. As NATE looks to battle new competitors, members turned their attention to addressing the needs of their existing clients. Jonathan Weaver of Peak Performers conducted an intense sales session designed to help NATE trade exchange owners learn how to understand and speak their customers? language, as well as to show how prospects and members view their business. NATE also selected the following committee chairs for the next year. Ric Zampatti of The Barter Company in Atlanta is chairman of the Barter Association National Currency (Banc) Committee, and Jerry Howell of Midwest Business Exchange in Kalamazoo (MI) is chair of the Programs Committee. Dale Mardak of International Monetary Systems in New Berlin (WI) is chair of the Membership Committee. NATE president Fran Crumpton of Gulf Coast Trade Exchange in Pensacola (FL) will continue to chair the Education Committee. Jim Cassidy of Barter Partners in St. Joseph (MI) will remain chair of the Technology Committee. Eight trade brokers earned the prestigious Certified Trade Broker designation during the NATE convention. The trade brokers successfully completed the standards and met the qualifications to attain Certified Trade Broker status are Mark Reilly, Shannon Niebergall, Dave Schiff, Jordan Kruger, and Francisco Theoduloz of Barter Network Limited in Toronto; Mark Bowman of IMS Barter in New Berlin (WI); and Miriam Worsnop and Jonathan Fantham of XO Limited in New Zealand. ?The NATE Certified Trade Broker Program challenges each one of us to strive for the highest level of service to our clients and ensures the continued growth and expansion of our industry,? said Fran Crumpton, President of NATE. ?This particular group of well-trained brokers will continue to be an asset to the barter industry.? The CTB Program is offered annually during the NATE convention. Lisa Boudreau of IMS Barter-Connecticut and Anna McDowell of ATX The Barter Company in Cleveland, assisted with the CTB training. Aliant Financial Services, one of the country?s leading providers in electronic payment services, has announced that they will be giving business owners a Free Gift Card Program with service for life of their account, as long as the merchants process their credit cards through Aliant. Aliant says it?s the only free gift-card program in the electronic payment industry. For more information on their free gift card program go to http://www.freegiftcardprogram.com.